The latest Blog from Best of British Art! Perfect Personification in Paper - meet the artist, Debbie Court. How long have you been sculpting for? I started sculpting in 2014 after seeing a YouTube clip of a woman called Jonni Good who was making animals from papier mache. She made a type of 'clay' from a recipe which included paper and glue and various other ingredients, and was able to really sculpt the figures and get great detail. I was fascinated and just had to try it. I used her recipe for the 'clay'... in fact I still use her recipe... and bought her book and I was hooked! I soon found that animals are not for me however... I absolutely love sculpting the human figure. Most of my work is commissioned and so the starting point is usually given to me... or at least the basic idea. I am usually asked to sculpt a portrait of an actual person - sometimes someone known to me, but often a complete stranger - so I spend quite a long time with the client asking questions about the subject... trying to pick up on character, interests, any quirky details or objects that are special or specific to them. Then I obviously find out about their physical characteristics, typical stance, etc., and I ask for as many photos as I can get - especially head shots from all sides. I do a lot of thinking then - planning out in my mind how best to capture the essence of this person - in paper! I make sketches to get a feel for the subject and to plan what will or won't work when I get to the sculpting stage. Once all of this is settled in my mind, I make the armature - the basis for the sculpture. Again, I take considerable trouble over this process. I don't use wire - the whole sculpture is made of paper and so the armature is made of newspaper and masking tape - and it is this process which really sets the stance of the finished figure and hopefully captures the character of the subject. I endeavour to create as much movement in my work as I can. I like my pieces to look as though they've caught the subject in a split second - either mid-movement or in a passing expression or position in a quiet moment. But of course - whatever the pose, the subject has to be recognisable and meaningful to the client. The armature is key to getting this right so it takes a bit of time. When I'm happy with it, I make the papier mache 'clay' and start to apply it to the armature. Just like sculpting in any other medium, I use the papier mache to create the impression of muscles, bones and features and the piece gradually comes to life. It's exciting to see the idea I had in my head emerging from the papier mache - its a thrill every time and I think that's why I never get tired of this process. Sometimes I leave the sculpture in its natural form without colour - these can be very powerful and dramatic and I feel they allow the viewer more freedom to use their imagination about the piece. With these 'natural' sculptures, I sculpt all of the clothing and fine details, whereas if I'm doing a coloured piece, I combine sculpting the clothing and details with making them separately from coloured paper. I don't use paint if I can help it - except for anywhere where there is naked skin, in which case I use acrylic paint mixed to the required skin tone. Every other detail - hair, eyes, lips, clothing, accessories, etc., is coloured using coloured tissue paper rather than paint. So my sculptures are as close to 100% paper as I can get them. My background is in music. Although I was keen on both art and music at school, I was forced to choose between them and I chose music. I left Bristol to study music at Cardiff University and then stayed on in Wales to work as a peripatetic clarinet teacher in various schools in Cardiff before re-training in Arts Marketing and Arts Administration. But all the time, I was drawing and painting and making silver jewellery. Art was always vitally important to me and I was experimenting with all kinds of art - searching for something that satisfied that urge to create something beautiful. When I found papier mache, I knew I had found my 'thing'! Something just clicked and I knew this was what I wanted to do. I don't know about other artists, but I need to feel inspired by the subject I'm about to sculpt - that's the bottom line for me. I need to feel confident that I can bring something out of the piece - something that satisfies my own standards and that touches anyone who looks at it. It has to be something that sparks my imagination and inspires an urge and an excitement to create something of worth to me and the viewer. I think that exploration within the medium and experimentation is also important. It keeps the work fresh and exciting. Sculpting has a frightening element to it as well as all the good bits! There's always a chance that the material itself will let you down, that something will crack or break while you're working on it and hours of work will be wasted. Commission work is scary at times... you're challenging yourself to produce something that maybe you haven't tried before. With some pieces, you're trying new things in order to achieve the effect you're aiming for and you have to take risks sometimes. I create portraits and figures from papier mache and paper. I don't use wire or any other support in my pieces and I only use paint for skin tones. All other colour - for eyes, lips, hair, clothing and all fine details - is achieved using coloured tissue paper. I work mainly to commission although I produce a few pieces for exhibitions and galleries. Papier mache is a fairly unusual medium in which to sculpt - certainly to the level of detail I strive for - but it is a wonderful medium in which to work. Definitely figurative art but also the realism that you find in the paintings of the Impressionists. I love art that looks as though it is happening in front of you... as though you have just stepped into a moment in someone's life. In my work, I strive to create that immediacy and realism. What work do you most enjoying doing? I really enjoy commissions and portraiture. Commissions throw up a different challenge every time and keep me striving to solve them and master new techniques . Every commission I do teaches me something new and keeps my work fresh. I love the challenge of turning some newspaper and glue into something beautiful and I get a real kick out of people liking my work and then being amazed that it is made of paper! I really like to make my commissioned pieces personal to the person who will receive them. I make a massive effort to include small details that mean something to the recipient. In previous pieces, I've included miniature versions of books that they have written or particularly love; I've included replicas of jewellery they always wear, or clothing that they are particularly associated with; I include visual references to hobbies they enjoy or their occupations and even football clubs they may support! And in each piece I do, I enjoy trying to capture a feeling of a fleeting moment in time. I love sculpting the human face and body: elderly faces, strong features, delicate faces; a child running and jumping or someone moving gracefully, purposefully or dancing; the peacefulness of someone concentrating on a task, reading or dozing. I love sculpting the muscles of a leg, the bones of the shoulders or neck, the way a fold of skin lies or the drape of some fabric. I find all of these - amongst others - extremely satisfying to portray in my work. I love the way the papier mache responds to these challenges and the figures emerge from the papier mache 'clay' and come alive for me. I don't think I can say I have a favourite art work. I like artwork in many forms... if I see beauty and an element of skill then I appreciate it. It can be a simple piece or more complex, in any medium. I have a particular love of Impressionist painting and Manet's work in particular - possibly because it depicts people in realistic situations and captures everyday activities as if we have just walked past and seen it. I like his use of black and his blending of colour. I'm not really keen on a lot of bright colours... I'm drawn to a more muted palette and I'm more interested in texture than colour I think. That's probably true in my own work. I also love Art Deco design and the work of the Arts and Crafts movement. I think there are three real-life situations that stand out as being inspirational to me personally. The first happened when I was in primary school and we made a life-sized model of a cow from papier mache. I absolutely loved that project and I remember it to this day. I never thought I would end up being so obsessed with papier mache, but maybe it was that cow all those years ago that prompted me to watch a YouTube clip of an American woman making animals from papier mache - that was the second situation that inspired me. I was astonished by the levels of detail she was able to achieve and the textures of the papier mache clay. Watching that clip made me try the process for myself and the rest is history! Thirdly, my great aunt was an artist in the late 1920s-1960s. She was a painter and a silversmith and although I never knew her, I have a lot of her paintings and jewellery. Her work still comes up for sale from time to time in auctions and I try to buy pieces whenever I can. She produced beautifully detailed works in oils and watercolours depicting flowers and everyday objects and I find her work wonderful. I have used some of her paintings as inspiration for some of my pieces and I like to think that she and I would have had a lot in common if we'd been able to know one another. I studied music at university and began my working life as a peripatetic clarinet and piano teacher in various schools in Cardiff. I did this for 15 years during which time I had my two sons and I fitted my teaching around looking after them and accommodating their various activities. Then I retrained in Arts Marketing and went to work at Welsh National Opera as their Marketing Officer and then the Administrator of their Education Department. I was with them for 12 years and then I became the Administrator for a charity working with profoundly disabled adults through the medium of music and dance. I now work part time for a charity offering vocational training for adults with learning disabilities which allows me to spend most of my time sculpting. I loved art at school, but was forced to choose between art or music....it wasn't possible to do both which seems completely ridiculous to me! So I did music at university and went on to a career based on music. But I always retained a need to follow artistic pursuits and was always drawing and painting and making jewellery in my spare time. As I got more and more into administration in my career, the less I was able to follow these pursuits and I really missed them. I never seemed to have the time or the energy by the end of the day and I really felt the loss. When I had the chance to work part time, I took it and was able to get back into my art again and it was like a missing piece of a puzzle being put back into place. And when I discovered papier mache, I really felt that I had found the thing I had been looking for and could express myself artistically in a full and meaningful way. I am totally obsessed with sculpting in papier mache now and can't imagine life without it. I am extremely fortunate that I am always getting lovely comments about my work. The fact that it is a relatively unusual medium catches people's attention and when they know that the pieces are made almost entirely from paper, that always causes a positive response - and some incredulity! 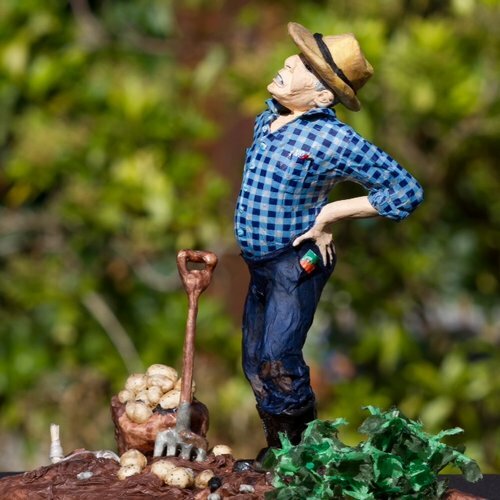 I made a piece called The Gardener (pictured above in this article) which was of an elderly man grimacing and stretching his back after digging his vegetable patch. I exhibited the piece in an exhibition and received so many comments about how it made people feel and how they identified with this character. So many people saw in him themselves or someone they knew! I sold the piece and could have sold it several times over! Another memorable response was when I asked a friend of mine if I could sculpt the head and shoulders of her son who has Down's Syndrome. He has the most beautiful face and I was really drawn to have a go at sculpting him. I left the piece in its natural form - no colour - because I wanted my friend to be able to project her own interpretation onto the piece as she knows him better than anyone. I was quite anxious when I showed her the finished piece as I didn't want to upset her or cause offence by depicting the very specific features of Down's Syndrome. Her response was very memorable. She was quite emotional about it and thrilled that someone had found beauty in her son's face. I found that very rewarding. I have found there to be a certain prejudice in the art world towards papier mache and art that is considered 'craft' in general. To many, papier mache is still seen as classroom craftwork and looked down upon rather than seeing it as art on a par with painting, sculpting etc. It has become my quiet, private quest to elevate its reputation in the art world! I think that art that is classed as craft generally receives a raw deal in the art world which is obviously a terrible generalisation on the part of gallery owners and promoters of art - and extremely narrow minded. There is so much work out there in the craft world of extremely high quality and to my mind, the best examples should be celebrated and promoted. Anyway, papier mache is such a versatile medium in which to work, and my own personal aim is to produce the best work I can to show it off! What research to you do? When I have an idea for a piece of sculpture, I use the internet extensively to find references. I have a file on my computer called 'body parts' into which I put any photos I find of arms or legs, or hands or facial features or people doing various activities or in different situations - anything which I can reference when I'm sculpting a human form. I also have a wonderful book with anatomical drawings of the body and the skeleton. I find this extremely useful and I refer to it often to get a feel for what is under the skin of my subjects and how various parts of the body actually fit together! I recently went to a class given by a woman who makes models of the human body in wax for forensic purposes! It was absolutely fascinating. We concentrated on facial features and learnt a lot about how the various muscles of the face work to change facial expressions and we sculpted a face in wax. I found that really useful research. I don't think I have a dream project... every piece I do is special at the time. I only take on projects that inspire and interest me. I think I'm always striving to produce the best work I can do and I still feel I have a long way to go - so I guess my dream project would be one that turns out perfectly. But I don't think you ever feel something is absolutely perfect. No matter how hard you try, there's always going to be something you think you could do better next time! Name three artists you’d like to be compared to. What a tricky question! Obviously it would be wonderful to be compared to any of the great sculptors but that would be ridiculous! But in my world of papier mache, there are some amazing sculptors at work - like the American sculptor Will Kurtz who makes wonderfully observed life-sized sculptures of real people he sees around his home town of New York. He makes no attempt to disguise that they are made of newspaper and captures their attitudes and characters perfectly. Another beautiful papier mache artist is the French sculptor Melanie Bourlon who has created a magical world of imaginary creatures in human costume, and then there's the completely zany, off-the-wall work of German artist Dunja Schandin. Will and Melanie are established, well respected artists who I would say have conquered the prejudices within the art world and have a reputation for beautiful art and show their work in galleries and exhibitions. Dunja's work is perhaps harder to appreciate, but her reputation is growing and I think she is about to break through onto the art scene in Germany in a big way. I hope so anyway, she deserves to. I would be thrilled to be compared favourably to any of these artists. Favourite or most inspirational place? I love Venice. I've been a few times and I find it a magical place. Apart from all the architecture, art - and particularly the sculpture - that is there, it also has a wonderful heritage and reputation for mask making in papier mache. When I was there last year, I visited the studio of a man who has been making papier mache masks for years....and his family before him. It was fascinating to see him at work and very inspirational. Closer to home, I love the Pembrokeshire coast in west Wales. I spend a lot of time there with my husband, and it is our bolt-hole from the madness of everyday life. We love walking there and relaxing, but we also take our work there and find it easy to transfer that aspect of our lives there. I carry a little card around with me in my purse which has a quote from one of my heroes of the past, Coco Chanel. It reads: 'how many cares one loses when one decides not to be something, but to be someone'. I think that is a great piece of advice - especially in the world of art. It is easy to get carried away with wanting to be 'an artist' and wanting people to see you as such. I don't consider myself to be an artist... I love being able to do my work, and I work hard to improve and grow as much as I can. But I follow my own path and stay true to what I like and enjoy. I would never work on something that I didn't find pleasurable. I know that I'm never going to make a living from my work because I can't produce enough of it. But I'm happy that so far, people have liked my work and asked me to do things for them. If they consider me 'an artist', then that is lovely, but I would do what I do anyway because it gives me great pleasure. I've been extremely fortunate so far in my work with papier mache. I've been involved in some fascinating projects and I've met some lovely people who have given me amazing opportunities. I plan to continue like this and see where it leads me. Ultimately, I'd like my work to be seen by as wide a range of people as possible and for papier mache sculpture to be seen as fine art and not classroom craftwork. I'd love my work to be recognised at some stage, but I'm happy to keep working and striving to produce better and better pieces and keep pushing the material as far as it can go.